Foothills Brewing -Winston-Salem – and yet another Cuban! Surprisingly, North Carolina does not produce the most beer in the world. It doesn’t produce the most beer. It doesn’t even produce the most “craft beer”, whatever that means. North Carolina apparently ranks 8th, https://www.brewersassociation.org/statistics/by-state/, but I’m sure if we dug into the data, North Carolina would rank even higher in some categories. Maybe the most independently owned microbrews, or restaurant/microbrews, or the most craft breweries ever squeezed onto one city block, etc. I don’t know. But I live in North Carolina, so I know that you would have a difficult time not finding a brewery wherever you are. Try it out. Stop whatever you’re doing. Stop wherever you are. Pick up a stone and throw it. That sound you hear is likely the sound of a stone hitting a fermentation tank. Recently I was in Winston-Salem. When I stopped what I was doing, picked up a stone and tossed it, it hit Foothills Brewing – http://www.foothillsbrewing.com/. I visited Foothills Brewing with a friend of mine after the Notre Dame/Wake Forest football game. The game was a complete mismatch, with Notre Dame handling the Demon Deacons easily – 56 to 27. The other mismatch was me versus the sun. I sat on the visitor’s side of the stadium. After baking in the sun for over three hours, I felt like a Cuban Sandwich, which got me to thinking – I want to eat a Cuban Sandwich. So, after the game, my friend and I found our way to Foothills Brewing, along with several other Irish fans, all in different shades of green, blue or gold. Still recovering from the heat, I couldn’t imagine trying a local brewed IPA. I wanted a large glass of cold water and something from the menu, and, happily, I found another place that produces a delicious Cuban Sandwich. Elatedly, I think I found one of the best Cuban Sandwiches in the state. Again, my quest to find the world’s best Cuban Sandwiches within the state of North Carolina may be misguided. The only thing that could possibly end the search is a trip to Miami or Cuba and one of their legit Cuban Sandwiches, which I expect would ruin all other Cubans. But Foothills Brewing produces one that I’d like to see go against the classic providers of the Cuban sandwich. The Foothills Cuban stood out the same way the other top Cuban in the state standout – it’s all about the meat. The worst Cubans I’ve had across the state are the ones that toss in what looks, feels and tastes like refrigerated loose meat – something from a yellow Oscar-Meyer container – I’m looking at your Gourmet Chip Company! The best Cubans are the ones that have aged pork, or properly seasoned pork, or at least warmed pork! 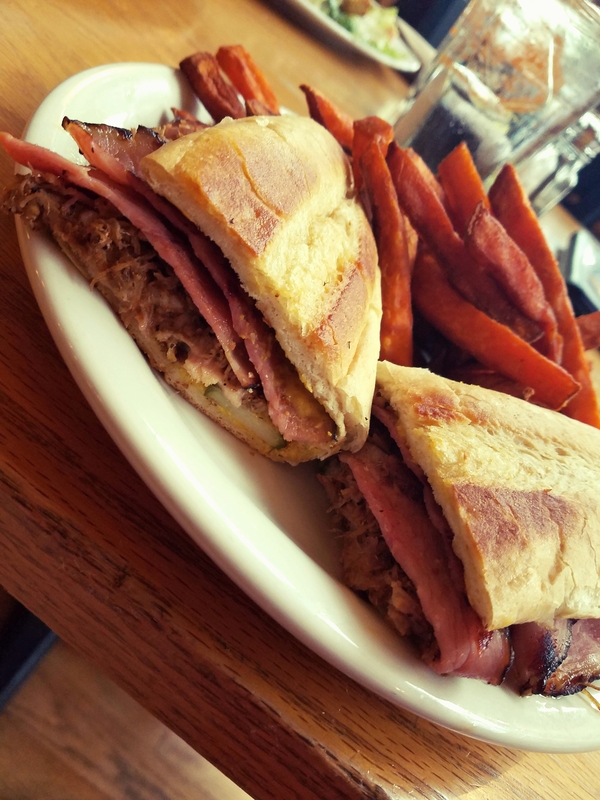 Foothills Brewing’s Cuban had exactly what you wanted – warm, crispy, flavorful! Try their cold glass of water too. It’s very good.